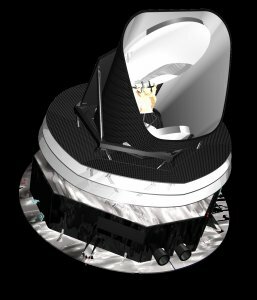 Planck, formerly known as COBRAS-SAMBA (Cosmic Background Radiation Anisotropy Satellite / Satellite for Measurement of Background Anisotropies), will carry a telescope with a primary mirror of 1.5 meter in size. The telescope will focus radiation from the sky onto the payload, two arrays of highly sensitive detectors called the Low Frequency Instrument and the High Frequency Instrument. They will measure the temperature of the Cosmic Microwave Background radiation over the whole sky, searching for regions slightly warmer or colder than the average.